In 2013, Tom Wynn received a phone call from a Los Angeles-based artist who wanted to show prehistoric artifacts had artistic value. After nearly five years of research and travel, Wynn and Tony Berlant will open “First Sculpture: Handaxe to Figure Stone,” Jan. 27 at the Nasher Sculpture Center in Dallas. Wynn is a UCCS distinguished professor in anthropology. A sculpture exhibit is far from his experience in the peer review process he’s used to in his multiple books and articles. Berlant works in visual arts, but is active in archaeological conservation. 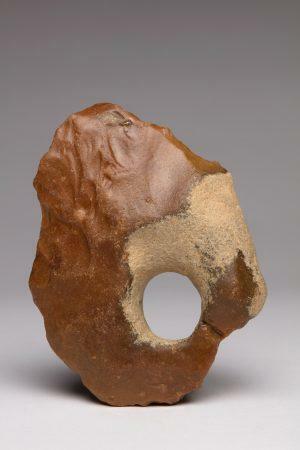 He saw that among the millions of handaxes discovered, several were carved out of certain stones or carved in a purposeful way for visual appeal. The two traveled to museums across the world to analyze and select the pieces that will be on display Jan. 27 through April 29. 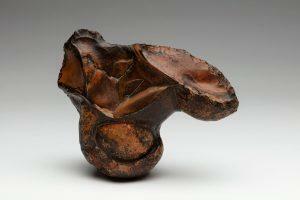 It is being called the first museum exhibition to present handaxes as works of art. Art history typically begins with cave paintings in Western Europe approximately 40,000 years ago. The pieces that Wynn collected range from 50,000 to 2 million years old. In a visit to a small museum in France, the two nearly missed what could be the oldest discovered artifacts of animal sculptures. While Wynn was able to provide the scientific background for the exhibition, the show is still an art display. Because of the different focus, it didn’t follow the same peer review standards in academic articles. The exhibit is made possible by the Lyda Hill Foundation and the Eugene McDermott Foundation. Hill is an active UCCS supporter and received an Honorary Doctorate in Human Letters in 2014. “Neandertals produced no depictions. There is nothing in the extensive archaeological record that could in any way be construed as a Neandertal’s representation of an animal, or a person, or indeed of anything.” So writes Thomas Wynn in his book “How to Think Like a Neandertal”. Billed as “the first museum exhibition to present ancient handaxes and figure stones as works of art”, it falls well short of this, and even a modicum of due diligence on the part of the curators would have made this evident. There was, among others, the April 2000 exhibit “Werktuigen en kunst (tools and art) van de Neanderthalers uit Fontmaure, Midden-Frankrijk” at the Museon in the Hague, which displayed some of the same Fontmaure stones now shown at the Nasher. And in July 2015 there was Richard Wilson’s large display at the Watford Museum near London, which, being honest, he titled “Neanderthal Art II – The Fontmaure Figure-Stones”. And speaking of Richard Wilson, Dr. Wynn and Mr. Berlant visited with him during their trip to the British Museum, querying him extensively on his research but failing entirely to mention him in their big and glossy “scholarly catalog” accompanying the Nasher display. At the same time, they gush about their “stimulating talks with Dr. Nick Ashton of the British Museum”, who has long been disparaging the whole figure stones concept. Giving credit where it is due, this is a beautifully configured exhibit, and it seems no expense was spared in acquiring the artifacts on display. When I visited on 22 February 2018, the staff were at all times friendly and helpful. It’s just sad that the curators are apparently so disingenuous and self-serving.